In the twenty-first century, information has become such a fundamental aspect of each society that its access is a basic human right. This has prompted for convenient access to reliable and up-to-date information for decision making through the use of the Information and Communication Technologies (ICTs). However, most people in Africa fail to access information due to the language barrier as most of ICTs use languages that are of western origin. How do we remove the language barrier? In order to remove this language barrier, software localization has become one of the best alternatives to make ICT appropriate to a target locale. Localisation of software involves adapting a software product to the linguistic, cultural and technical requirements of a target population. In Malaŵi, Zambia and other Chicheŵa speaking regions, localisation of software is still in its formative stages as there are currently no localised software applications in computer systems. What shall we do, men and brethren? I started localisation at my undergraduate. 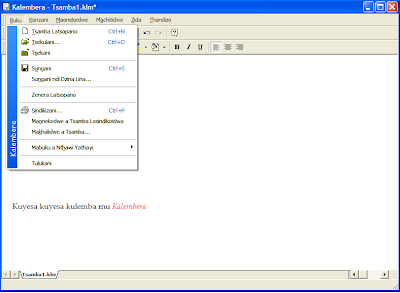 In my final year project, I developed a localized lightweight word processor, Kalembera. It has a Chicheŵa interface. You can get more details on the project from http://bkankuzi.blogspot.com/2009/01/undergrad-student-in-malawi-develops.html . Of course there are some few things to get fixed and a few features to be added. Right now the word processor does not fully support tables and graphics. In addition, I have developed a spell checker separately. I am yet to add it behind the word processor. The Mozilla Initiative is an up and coming project. It is one example of free software localization projects that I wish to run. The project will help indigenous Malaŵians (and other Chichewa speaking reagions) access the Internet using a localised web browser. I am looking for more contributors. If you are interested please send me an email entitled New Member: Chichewa/Chinyanja Localisation Project (chichewalocaliser(at)gmail(dot)com). This will help us track our members. Talks are under way with members of the OpenOffice.org to help us with Chichewa localization. I would like to have access to the software and add Chichewa words to it. If everything materializes, we will have a fully functional free office suite. There are a lot of things to consider as far as localisation of software is concerned. I am not saying I am the jack of all trades in this respect. I need a lot of friends to join and help in. You do not need to be a programmer. You can contribute to the development of Chichewa equivalents for English terms. If you are too technical, so much the better. Linguists will also be of great significance to these projects as they will help in the editing and revising of the Chichewa terminologies. One thing which has to be taken note of is that these projects (except the Kalembera project) will be free and open source. Your contributions will be used and acknowledged using the general and public licenses that are used by the proprietors of these projects. Nice piece, thanks Edmond. Building a team and building a consensus on terminology early on is very important, especially if you have few standardised terms, or dialect differences, etc. I'd do some things differently with Irish if I were starting over. One very small, very useful project we could all work on is an exhaustive list of technical terms, common program commands, and the like - with suggested Chichewa equivalents. Simple terms like "Click" are not universally agreed upon (though most people I know just use 'panga'). What about "information" and "data"? In some cases "Zidziwitso" might make sense - in other cases, perhaps "Nkhani" or even just "Mawu." When I doubt, I usually just cheat and say "Information" with a Malawian flair - 'inifomeshoni' - but you're right, that sort of skips out on the whole idea of localization. Well Keep up the good work chief, that is awesome.